As with any story, there's always a story behind the story. When I first started writing the History of Photoshop, many of my sources at Adobe weren't really aware that February of 2000 was actually Photoshop's tenth birthday. It wasn't until I pointed out that Photoshop 1.0 first shipped in February of 1990 and thus, Photoshop had a significant birthday coming up that people in and outside of Adobe started taking notice. 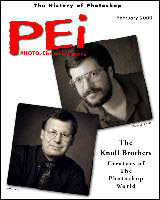 I approached Elmo Sapwater at a trade show and told him that I had a History of Photoshop article and asked if PEI would be interested? He enthusiastically said "Yes!" I think this was at Seybold San Francisco in 1999. It wasn't until later that we worked out the details. I had thought that the 10th birthday merited a cover image. I just thought that this momentous occasion should be commemorated in some visual manner. So, Elmo and I began talking about a variety of ideas. My thought was to have a simple white background with portraits of Thomas and John Knoll on the cover. I had already shot a portrait of Thomas and I figured getting this on the cover would be a great excuse for John to let me shoot his portrait. To illustrate my idea I even created a mockup of the cover using a shot of Mark Hamburg where John would go. The powers that be at PEI thought that portraits would be cool, but they wanted "something" in the background that said "Photoshop!" Fast forwarding a couple of months ahead and I was finally ready to photograph John at ILM located in San Rafael, CA. For me this was going to be a double prize, not only shooting John but also getting to visit ILM. I flew out on an early morning flight to San Francisco and rented a car. I had made previous arrangements with contacts in ILMís PR department and even had general directions to the place via a map from MapQuest (on the Internet). Of course, the map didn't mention that the city government of San Rafael had just made the street ILM was located on One Way. Nor did the PR contact tell me that ILM isn't listed as ILM. Instead the sign out front says Kerner Optical. Apparently, George Lucas wanted ILM to keep a low profile and had signage created for a mythical company named Kerner. I met my PR contact and dragged the photo equipment back to a conference room near John's office. I was working without an assistant but got some help from the lady from PR. I was all set to shoot when John came in. The shoot lasted about 30 minutes and John had to rush back to work. I came back to Chicago, had the film processed and selected two frames that I particularly liked and e-mailed them off to John Knoll and Debbie, the art director at PEI. We discussed what we could do with the background to the portraits. 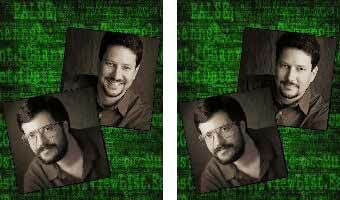 (I don't really remember who came up with the idea of getting some original Photoshop code to use as a background.) But, both Elmo and I pestered Thomas into finally searching his files to find some old Pascal Photoshop code. Thomas e-mailed it to me and I converted it into type in Illustrator before bringing it into Photoshop as a channel. We then discussed some possible iterations of the code and I did a variety of versions for PEIís review. I liked several of the gray colored versions, but it was decided to use one of the green versions-a decision that I don't regret. Just about the time we thought we were finished, I got a last minute e-mail from John saying that his wife REALLY liked the smile version, so, could we use that one? I did a quick smile version to show PEI. But, we all rather liked the no smile version-even Thomas, John's brother. So that's what we went with. 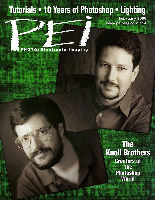 So, there it is - the Photoshop creators and original Photoshop code on the cover of the PEI February 2000 issue.